Today was a very special day for Ainsley’s Angels of America and the local chapter I volunteer with. 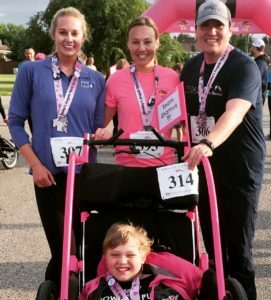 Not only did a national event called Power to Push begin today in our sweet little city of Moorhead, Minnesota, the kickoff was at the Sunrise 5k – the very first race hosted by our local Ainsley’s Angels chapter. Big shoutout to all who came out to run for inclusion and to all y’all out there who ran with us virtually! I had a great day, running with my friends Trav and Riley, both first-time Angel Runners. We had a ton of fun and the extra-special honor of running with Shamus Evans, who is joining his dad for a 1,700-mile run down the Mississippi River to the birthplace of Ainsley’s Angels. I was so proud to be part of this race and send off the Evans on their journey to raise awareness of inclusion. Check out Power to Push and follow the Evans throughout the month of July. If you ever have the opportunity, I strongly recommend running as an Angel Runner with Ainsley’s Angels. Visit the Ainsley’s Angels website to find an ambassadorship in your area. And when you do get a chance to run, be sure to share it on Twitter with the hasthtag #wellirl.